Didn’t have a lot of luck finding anything in search. I am Flying in F on the 752 SLC-JFK soon. This is the config with the four rows of lie flat in 2/2 layout. DL is marketing the flight as “First”, not DeltaOne nor premium transcon. Given shorter flight duration, I expect a level of service similar to SLC-HNL on the 763 - i.e. Yes, it will be regular domestic F service. Only the hard product differs. I was pleased to see upgraded bedding on this flight. Wait are those new seat covers? Yeah - some kind of suede-y alcantara-y kind of thing. I was wondering the same thing. IIRC, these were some of the last cabins to still have "Business Elite" branded leather. I wonder if they decided to test a new material? It looks nice. Maybe a compromise between cloth and the "leather". Maybe leather is a bit more "sanitary" so to speak, but cloth is just so much more comfortable. Hopefully the seat comfort was still the same? I always liked these. I think it can be hit or miss on that route, I've taken it on the lie-flat product several times over the past few years, and also had the same 752 swapped out on some Florida-JFK flights, and the bedding often depends on simple luck of the draw...the meal, however, has been the standard distance-based domestic F meal...not the Transcon. I've found since at least once daily SEA/JFK went D1, any other flat bed aircraft get the Westin bedding. I think they don't want to screw up and miscater the D1 flight by accident with regular. I fly this route at least once a month and sometimes more and you tend to see a lot of the same FA's on the route (not sure why as I don't see this with many other flights out of slc). Its typically a 737 or airbus a320 and the seat pitch is standard domestic first. I always get bulkhead since I'm taller and need the extra legroom. Bottom line, be prepared to be disappointed. This is my first time on this config, but I’d say seat comfort about the same as 763 lie flat seats. I would definitely fly this again. 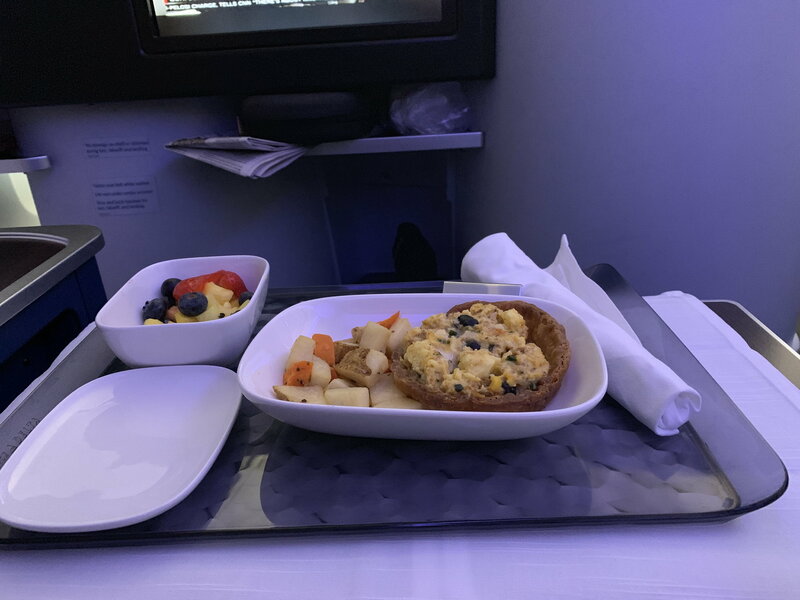 ...the meal, however, has been the standard distance-based domestic F meal...not the Transcon. Yup. Standard F style food. I had some sort of egg-y quiche-y thing. Mrs. pauly_long had an oatmeal and fruit dish. Both better than a poke in the eye with a sharp stick, but neither was anything special. I fly this route at least once a month and sometimes more and you tend to see a lot of the same FA's on the route (not sure why as I don't see this with many other flights out of slc). Its typically a 737 or airbus a320 and the seat pitch is standard domestic first. 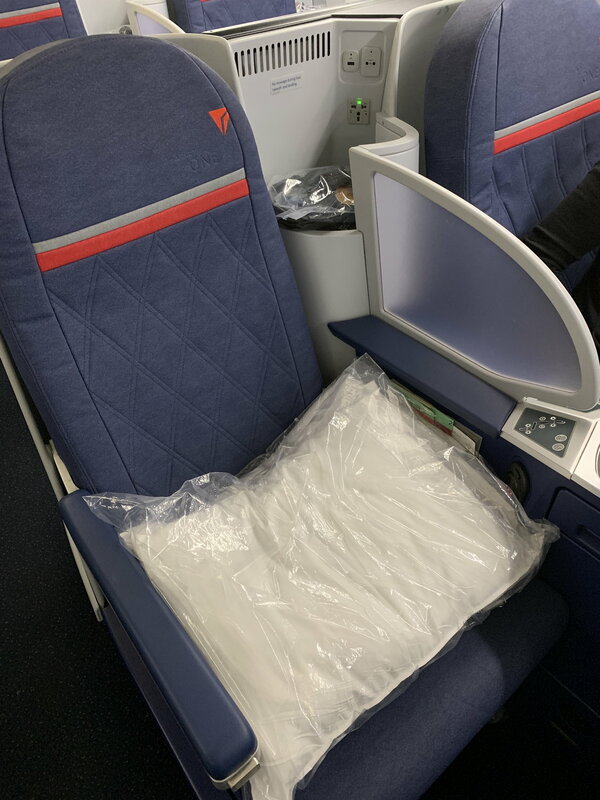 Give that zero Delta 738s or A320s have lie-flat seats you shouldn't expect anything different from Domestic F seating. Hmm, I think the group consensus would put 75S above 763 in terms of comfort (ie discounting the lack of all aisle access) actually. So I hope this isn't a (relative) change for the worse.